﻿Professional Moving Services in Lewisville are only a call away with Anything Goes Moving Company. 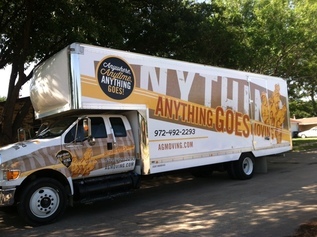 As an Affordable and Fair Priced Lewisville Moving Company, AGMoving utilizes Professional and Expert movers, packers, and drivers when hauling your personal belongings. Around the Lewisville community you may see our trucks moving yet another fully satisfied customer. We make a point to ensure your satisfaction when your belongings are in our possession. We treat your property as highly valuable heirlooms - not to drop, scrape, break, or rip anything. Our drivers are courteous and defensive drivers, as they tow your prized possessions. When you choose AGMoving in Lewisville, you can rest assured your move will go smooth. Both Lewisville Residents and Business Owners agree, Anything Goes Moving is the Number One Moving Company to call when you want the job done Professionally and done Correct. We are a locally owned, locally operated, and locally loved moving company that wants nothing more than to earn your respect and repeat business. For a free Moving quote in Lewisville, TX, give Don a call today at 214-232-7478.